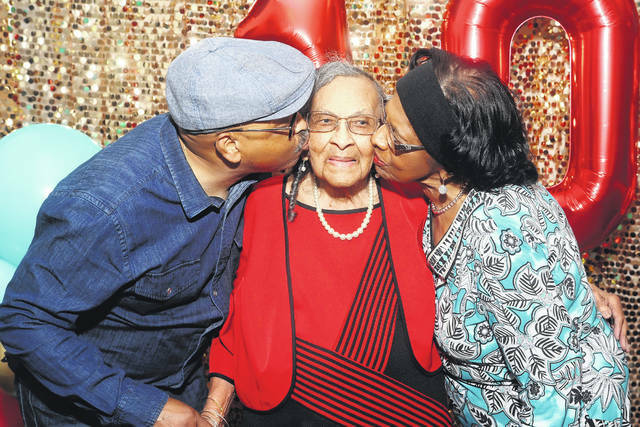 Gary Wilson and Barbara Banks plant a kiss on their mother, Thelma Wilson, of Lima, who turned 103 on Wednesday. Not bad. Not bad at all for a person celebrating their 103rd birthday. Barbara and her brother, Gary Wilson, threw Mom a birthday party Wednesday at the Husky Refinery recreation center, and it was hard to tell who had the biggest smile — Thelma, or the many family members and friends who arrived from New York City, Atlanta, Cincinnati, Columbus and Michigan. All had their favorite stories to tell about a woman who grew up in Phoenix City, Alabama, the youngest of 10 children, earning her the nickname Baby Doll. Her grandchildren recalled the tales they heard about Thelma’s childhood: How she would go to school on a horse and buggy and come home to help her mother with the cooking and cleaning. Since Thelma’s family had no inside water, she would have to draw water from the well to clean the dishes. Over the years, Thelma’s love for cooking was only matched by her family’s enjoyment of her meals. Thelma’s son, Gary Wilson, told how his mother has never known a stranger during her nearly 80 years in Lima. Thelma was born April 10, 1916, in Smith Station, Alabama. To put it into perspective, 10 days after she was born, Weeghman Park, now known as historic Wrigley Field, opened in Chicago. Thelma has witnessed the struggles and triumphs of the Civil Rights movement and saw America put a man on the moon and the Berlin Wall come down. She was a young woman during the Depression. “Tough times bring out the best in you,” she said. And the best in Thelma Wilson is her deep faith in God. For Thelma, Holy Week and Easter Sunday are every day. She’s a proud member of Fourth Street Missionary Baptist Church and for years sang in its choir. “The Lord and family, that’s what matters,” she said. She lost the love of her life, Wade Wilson, in December 1973, and also has outlived two children. She feels blessed to have 15 grandchildren, 22 great-grandchildren and 10 great-great grandchildren. Thelma Wilson has lived a long life, and clearly, she has touched even more. ROSES AND THORNS: That sound coming from the rose garden is a coach’s whistle. Rose: To Melanie (Halker) Moore, a 1995 graduate of Ottawa-Glandorf High School. She was named the head women’s basketball coach at Xavier University. Rose: To Luke Haselman, a 6-year-old Glandorf Elementary student. He threw out the ceremonial first pitch on opening day for the Toledo Mud Hens. Luke has been treated for leukemia for two years and is a cancer survivor. Rose: To Rachel Hern, who organized a cleanup of Lima’s downtown on April 7 that saw more than 100 volunteers show up to pick up trash. Volunteers came from all walks of life including a kindergarten class from Shawnee. 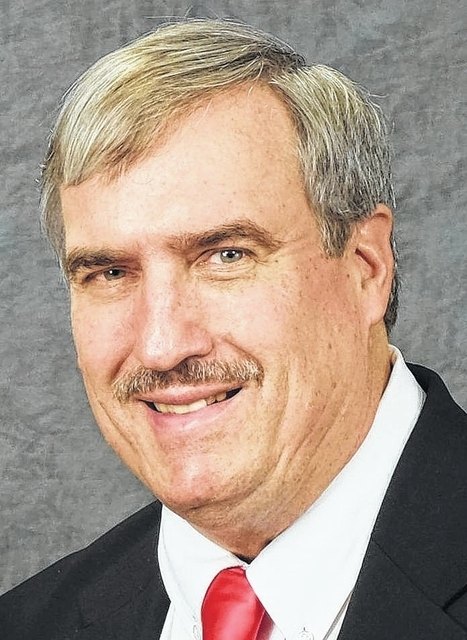 Rose: To Marvin Schwiebert, 65, who retired from the Putnam County Sheriff’s office after 44 years of service. Thorn: For the sixth time Bath Township firefighters were called to the former Lima Inn on Neubrecht Road to extinguish a fire. The latest call was April 6. Thorn: A fire at the Cloverdale Town Hall has been ruled an arson.